Osaka, Japan was rocked with a 6.1 magnitude earthquake, one of the most powerful quakes to hit the Kansai region in decades on Monday morning rush hour leaving at least three people including a child died while causing injuries to more than 240 others. The Meteorological Agency said the earthquake occurred at 7:58 a.m. at a depth of about 13 km in the northern part of Osaka Prefecture. The earthquake is said to have woke up the Kansai region, both literally and figuratively, since the region remains as vulnerable as other parts of the country that have been more seismically active since the huge 1995 Great Hanshin Earthquake which then registered a magnitude of 7.3 and killed over 6,000 people and massively devastated Kobe. One of those confirmed dead is 9-year-old Rina Miyake in Takatsuki, Osaka Prefecture after she was tragically stuck when a wall surrounding a swimming pool fell on her as she walked past by. Another casualty was a senior citizen, 80-year-old Minoru Yasui who died after being hit by a falling wall, while several other people were also feared dead. 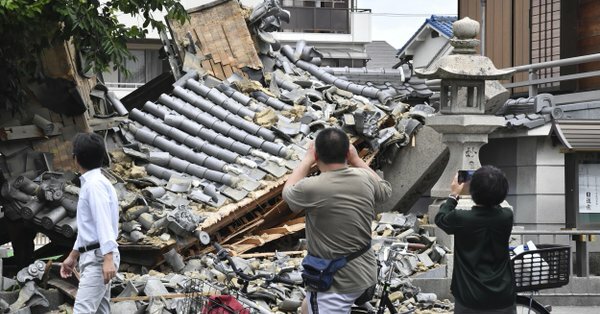 Local police and authorities also reported that dozens of fires took place in Osaka, Hyogo, Kyoto and Mie prefectures triggered by the quake. Police also said that Takatsuki and Ibaraki, gas supplies to 108,000 locations were interrupted, according to Osaka Gas Co., and a water pipe under a road in Takatsuki burst and flooded the area. Meanwhile, Kansai Electric Power Co. said its nuclear plants in Fukui Prefecture were operating normally. No abnormalities were also reported at the Takahama, Mihama and Oi nuclear plants in the prefecture. Osaka officials were still assessing the full extent of the damage on Monday afternoon. Other parts affected by the quake have resumed normalcy with the panic subsiding by the afternoon local time. Subway services to the city center part of Osaka have been gradually restored. Bus services from the airport to parts of the Kansai region, including Wakayama and Nara prefectures, were also back in partial operation as of mid-afternoon. The country’s weather agency issued a warning against landslides, adding that people should be cautious about possible aftershocks for a few days. Chief Cabinet Secretary Yoshihide Suga said in Tokyo that the government set up an emergency task force to further assess the situation. The government promised to do its best to extend disaster-relief efforts and help with reconstruction. Sorry to hear of the earthquake. But 3 dead and 240 injured in a Japan from an Earthquake is, as mean as it sounds, actually great news. All to often we would discussing the 100's/1000's death and a T-Wave following behind it.